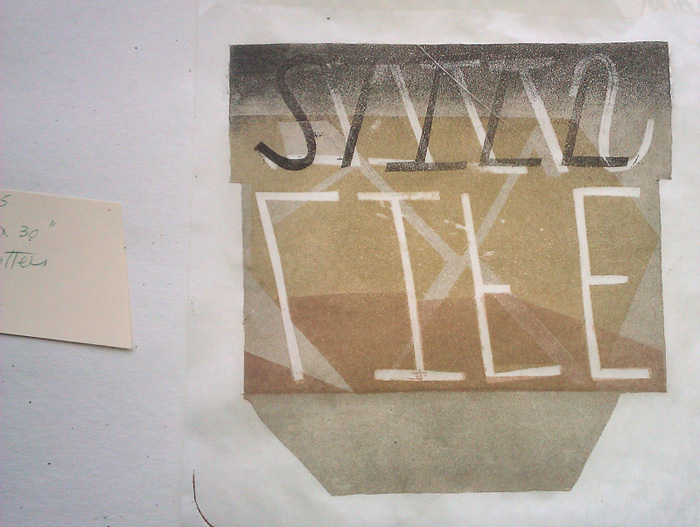 I have recently been offered an artist-in-residence opportunity at the Dayton Printmakers Cooperative. Part of this deal is that I will lead two workshops later in 2012 (assuming the world does not end). 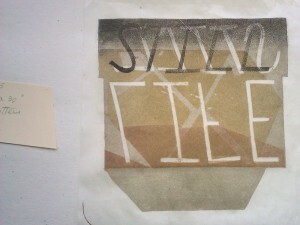 In summer a collage workshop will take place and in fall a additive/reductive stone lithography demo. The latter will be, more or less, an explanation of my specific approach to cranking out color layers with stones. So far the studio has been quiet. I am still fumbling around trying to find things that I need (like rosin and talc), but in the meantime here is an in progress shot of a current print. Three color runs from the same stone… additive and reductive… accomplished in roughly 5 hours of work [small edition size].